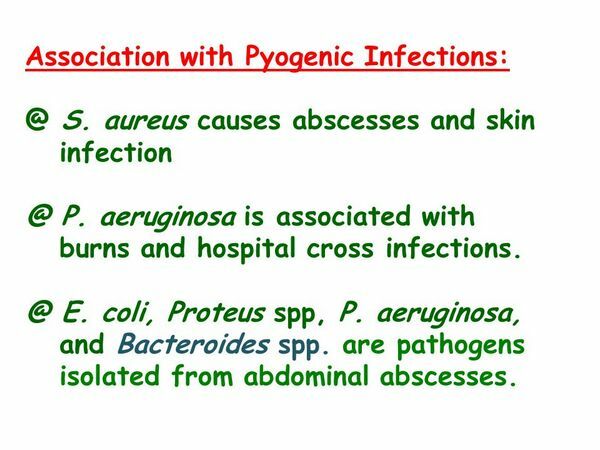 S aureus is the leading bacterial cause of pyogenic skin lesions (Box 46-1). Folliculitis, infection of the hair follicles, is a local suppurative process causing indurated papules or pustules, often with a hair exiting from the center of the lesion. There is local erythema and tenderness, but the patient is not systemically ill.
A furuncle ("boil") begins as a hair follicle infection and extends locally to form an abscess, characterized by liquefaction of necrotic tissue. Clinically, this presents as a well-circumscribed, fluctuant, tender, erythematous collection. Infection on occasion spreads to the surrounding epidermis, causing cellulitis. Common sites for furuncles include the face, neck, axilla, back and groin. Carbuncles differ from furuncles in that they extend to the deeper subcutaneous tissues. They are most commonly found on the posterior neck and upper back. These infections are less circumscribed than furuncles and may be associated with draining fistulae. Patients with carbuncles are often systemically ill, exhibiting fevers, chills, and malaise. Folliculitis and furunculosis are usually localized processes, and the peripheral WBC count is normal. Carbunculosis is associated with a systemic immune response, manifested by leukocytosis and a predominance of immature WBC. Blood cultures are frequently positive in patients with carbuncles. The differential diagnosis of folliculitis includes pseudofolliculitis barbae, insect bites, acne vulgaris, foreign body reactions, and milia. Alternative diagnoses for furunculosis include pilonidal cysts, cystic acne, and hidradenitis suppurativa. A carbuncle may be confused with a furuncle, a deep-seated skin infection such as necrotizing fasciitis, or a kerion. These infections are generally self-limited and do not disseminate beyond the skin. Local complications include cellulitis and osteomyelitis of adjacent bone. There have been anecdotal reports of facial lesions ascending intracranially to cause septic cavernous vein thrombosis. Bacteremia, a relatively common complication of carbunculosis, may result in secondary infections including endocarditis, hematogenous osteomyelitis, and pneumonia. Pyogenic skin infections are diagnosed by clinical exam, with culture of purulent material obtained by incision and drainage to confirm staphylococcal infection and determine antibiotic susceptibility patterns. Blood cultures may also guide antibiotic therapy in patients with signs of systemic illness. Treatment for folliculitis and furunculosis is primarily supportive (Box 2). Stringent attention to hygiene is key; the affected areas should be washed at least twice daily with a mild antibacterial soap, and overlying clothing should be loose fitting. Furuncles either spontaneously drain or require incision and drainage once they have matured (come to a head). Antibiotic therapy is rarely necessary for these conditions. Carbuncles require both local surgical debridement and parenteral antibiotic therapy. Recurrent pyogenic skin infections are common in patients with nasopharyngeal colonization. Eradication of staphylococcal carriage with mupiricin may be indicated after repeated episodes of furunculosis. This regimen has good short-term efficacy; however, recolonization frequently occurs, and emergence of mupiricin resistance has been reported.